Cut chicken wings in half. Season with salt, pepper, and garlic powder. Next place the wings into a ziploc bag. Pour in flour. Seal and shake to coat the wings. Set aside. In a mixing bowl, whisk together all the remaining ingredients to make the fish sauce, except vegetable oil. Whisk until dissolved. Set aside. Heat oil in a saucepan on medium-low heat. 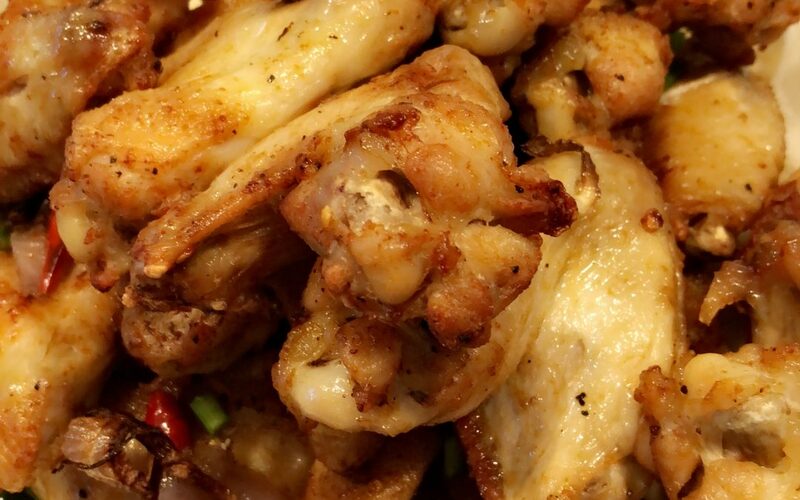 Take chicken wings and shake off any excess flour. Then place into hot oil and deep fry for 5-8 minutes on each side or until golden brown. Take wings out the oil and DIP the wings directly into the sauce. Serve while it’s hot. Garnish with some chopped green onion.